Microsoft's Start Menu troubleshooter has been designed to fix start menu problems that you experience when running devices with Windows 10. While the start menu may have lost some of its appeal in recent years thanks to the rise of other options to launch programs, most notable the taskbar upgrade introduced in Windows 7, it is still one of the central access points not only for programs but also for search and new features such as Cortana on Windows 10. Microsoft changed some things around in the start menu on Windows 10 as it features program links and application tiles side by side now. Start menu related issues that users may experience include problems opening it, missing items, or tiles that don't update or are not showing up correctly. Microsoft created a troubleshooting tool for the Windows 10 Start Menu designed to fix several common issues that users of the operating system may experience. Whether required applications are not installed correctly. For permission issues with Registry keys. Whether application manifest data is corrupt. Simply run the program after download. The first screen displays basic information about it. What you may want to do there is click on the advanced link and remove the checkmark from the "apply repairs automatically" setting. Doing so reveals all issues found to you and gives you options to select none, one, some or all of them that you want resolved. If you don't do that, the tool will repair all start menu problems it finds automatically without you getting a say in the matter. While that may be desired anyway, it is usually better to know about the repairs in advanced. 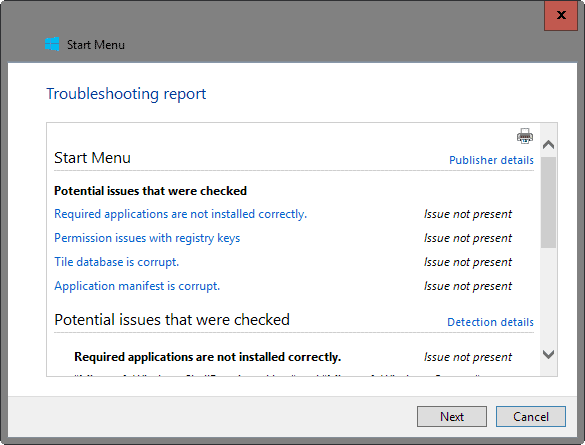 You may open a report in the end that lists issues that were identified by the start menu troubleshooter, and whether they have been fixed. 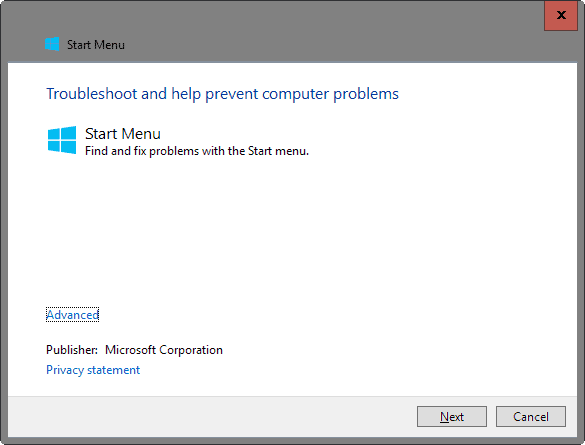 The troubleshooter is limited to detecting and resolving four Windows 10 start menu problems currently. This means that it won't provide you with a solution if the issue you are experiencing is not listed by it. If you suspect serious damage to the system, you may want to run sfc /scannow on an elevated command prompt to make sure that all system files are in working order and not corrupt or modified. Tap on the Windows-key, type cmd.exe, hold down Ctrl and Shift, and run Command Prompt from the search results. This opens an elevated command prompt. Type sfc /scannow and wait until the scan completes. Windows checks core system files to make sure they are not corrupt or modified, and replaces them if they are. I needed this last week! I had NO start menu or action center for 4 days. clicking on them did nohing, nor the windows key… no idea why. did every “fix” I could find.. nothing. in the end I installed “classic menu”..
then, the menu came back. again, no idea why…. A restart didn’t fix it? Most people that experience these issues are fixed via restarting the computer (ctrl+alt+del and shutdown from that screen). No, tried multiple reboots with the problem persisting. Just fixed itself after a few days..
i have more than 35 pc’s with the same issues. only refresh windows 10 bring the menu back for 1-2 days and then it’s gone again. this tool is not fixing this issue so don’t spent your time. I ran the fix described in the article, but according to it everything it checks for is OK and there are no problems with the Start Menu.